Split Case Picking: Like a Trip to the Grocery Store? What can a trip to the local grocery store teach us about split case order picking? In a split case picking system, individual items are picked from bins or open cartons. This method is sometimes called each-pick or piece picking operations. Most of the time, these operations involve a great many SKU’s - in the tens of thousands at times - and low pick quantities. This is prevalent in e-commerce operations (such as the Container Store’s catalog fulfillment center), where items are shipped directly to the customer; parts operations (such as Aviall, an aerospace parts distributor), and other item-intensive operations. Basic order picking is the way most of us use the grocery store. We have a shopping list, a cart, and we’re off to the races grabbing the things we need for our order (and quite probably some things we don’t). 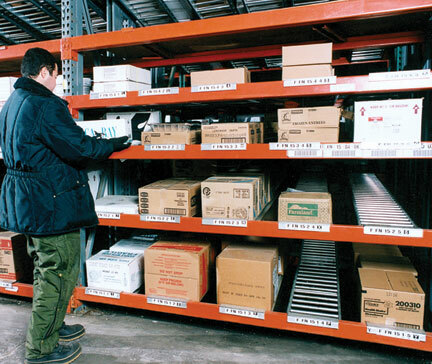 In a basic picking system, the product is stored at a fixed location in racking or shelving (sometimes in flow racking or other semi-automated equipment) and pickers walk to it in a manner not too different than the way you buy groceries - items are stocked in a spot and you go get it. Using a pick ticket, the order picker picks a single order, following his route through the static storage area. The way your warehouse is laid out in relation to the pick ticket is key. You want the route to be the most efficient possible, allowing the picker to work through his picks and end up back at his workstation. The pick ticket should be arranged in the same order the storage is, so that the picker doesn’t have to backtrack to pick any particular order. 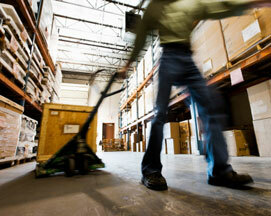 In a Pareto analysis, the fastest moving items should be the most accessible, closest, and easiest to pick. Analysis of what the fastest-moving items are should be done frequently enough to ensure that your picking flow isn’t a detriment to productivity. If a seasonal change or a market change has altered the fastest movers, it’s worth the time to reconfigure your storage layout. Travel time is probably the most important basic split-case picking system issue (see travel time details in relation to static storage vs. flow storage). You should look at your order volume and the number of picks per order - the higher the picks per order, the fewer orders, the more viable a basic system can be. To take the grocery shopping analogy further, imagine a store where you and eight other shoppers each split the store up into zones for picking. You pick up the eggs and dairy for everyone while someone else hits the produce aisle, and another person picks up bottled water, soft drinks, and juice. You and the other shoppers in this batch meet at the checkout area to distribute the groceries to each person in the batch. While this sounds like a silly way to shop, it works in a distribution environment. Orders in a batch system are grouped into "batches" where an order picker picks related groups of SKU’s for each batch in a single pass. Typically, less than a dozen orders comprise a batch. The picker selects one item or group of similar items for every order in the batch at the same time. This is especially true when the batch picking system is automated so that the order pickers can easily and quickly identify all the items necessary for their batch. It reduces travel time - after all, you’re only going to one aisle instead of all of them - and you can make additional picks in the same area. Since you’re picking multiple orders simultaneously, you’d have to be sure the orders didn’t get mixed up and one shopper’s cart isn’t given two jars of peanut butter while someone else gets none. One disadvantage is that orders waiting to become part of a batch aren’t being shipped. This can slow your process and may not work for some operations. Imagine yet another trip to the grocery store. 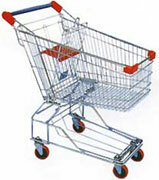 This time, order pickers assigned to a station along that aisle fill your shopping cart as it moves along the process. The pickers don’t move - your cart does - and a picker is responsible for only one small group of products, his specific pick zone. Consider it the equivalent of an order-picking assembly line. Orders move from zone to zone and the picker responsible for that zone fills the order for picks from his zone only. 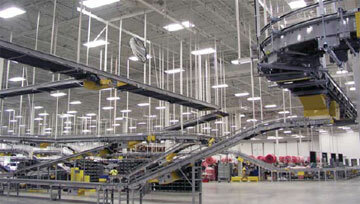 Typically a conveyor system is used in this kind of order picking system. An example might be the JA Majors distribution system. The challenge with pick & pass systems is that you must balance the zones so that one zone isn’t trying to cope with a mass of orders while another is idle. In that fictional grocery store, imagine assigning milk, eggs, and dairy to one zone and beef jerky to another. The first zone will always be trying to keep up while the second zone picker has nothing to do. The busiest zones should be adjacent to the conveyor line, ensuring that the most common picks require little travel time. Pick & Pass systems are best for large operations where you have lots of sku’s and orders, but not too many picks per each order. In the grocery store analogy, pick & pass might work well for a quick, evening trip for a few things, but not for the weekly family-shopping spree. Pick & Pass also gives you the flexibility to assign certain items to secure pick areas, automated systems, and other specialized pick systems as needed. Wave picking is a hybrid of both pick & pass and batch picking, except that everything for all active orders is picked simultaneously. All the zones are picked at once and consolidated into individual orders & shipments. It would be difficult imagining this working for that mythical grocery store, but the parallel would be that pickers race to get all the banana orders for every shopper who needs bananas as the same time, filling a central shopping cart, then distributing them to shoppers after all banana orders are filled. At the same time, pickers would be working in waves to get peanut butter, cat food, and other items for everyone who wants them, at the same time. This would typically be the fastest way to get all of a particular item dealt with in a multi-order system where there are plenty of orders, lots of SKU’s, and a good number of SKU’s per order. It’s good for categorizing orders by shipper, route, or region.